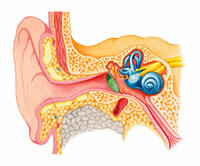 An ear infection can be very painful. The sooner you get your baby to a medical professional at the closest FastMed Urgent Care, the sooner your child will start to feel better. If your baby has a temperature of 100.4 degrees F or higher and is less than 3 months old, call the doctor immediately. Your baby could have a serious infection. When you bring your child to FastMed Urgent Care for an ear infection, the doctor will ask about symptoms and use a lighted otoscope to look in your child’s ear. If the ear drum is inflamed and signs of infection are present, a prescription for antibiotics will be given and we can also suggest over the counter pain killers that are right for your child’s health. You should give the antibiotics as prescribed until they are completely gone. Your child may feel better, but that doesn’t mean the infection is entirely gone. FastMed Urgent Care in Arizona and North Carolina is open 365 days a year, with extended office hours to treat your child for an ear infection. Don’t worry about trying to schedule an appointment, bring your child as soon as you can – we’re a walk-in clinic.